Sail Deals is a tool that will provide you with various commercial advertisements only even if it says that it will provide you with tools for enhancing your browsing experience. Like previously published SuperWeb LLC applications, this adware says that it will enable you to find the best prices, compare online deals, and even search the web more conveniently. Even though its promises seem to be real, specialists working at pcthreat.com have noticed that Sail Deals will not act in a beneficial way. It means that it will only display its commercial ads on your screen. There is no doubt that all these ads are very irritating and annoying. On top of that, they might also expose you to various threats. The only way to prevent this from happening is to remove Sail Deals from the system. We are sure that you will know how to get rid of this program if you read this article. This adware program does not differ from other programs published by SuperWeb LLC because it displays commercial advertisements and collects non-personally identifiable information in order to do that. As can be seen, this adware is not going to perform any other activities, so there is no point in keeping it installed. In fact, we believe that you will definitely agree with us that it is worth removing it when you find out that it can cause harm to the system. Unfortunately, this might happen very quickly because there are links embedded into ads, but nobody knows whether they are trustworthy. We understand that you want to protect your system, so we highly recommend ignoring ads and hurrying to eliminate Sail Deals from the system. 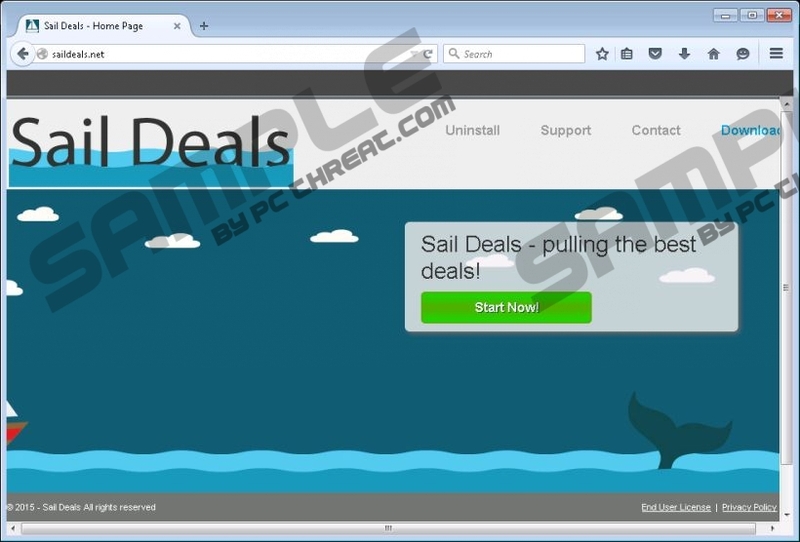 If you visit saildeals.net, which is the official website of Sail Deals, and click on the Start Now button, you will notice that the download does not start. Some computer users think that it is some kind of temporary error; however, specialists working at pcthreat.com say that it is not even surprising that it is impossible to download this program from its official website because it travels bundled with other applications and might enter systems with their help. If you also feel that this program has slithered onto your computer without your permission, there is a slight possibility that other suspicious programs have managed to enter your system as well, so you must scan your system with a diagnostic scanner after the removal of Sail Deals. If you remove Sail Deals, you will not see ads labeled as “Ads by Sail Deals” and “Provided by Sail Deals” anymore. In addition, you will know that nobody tracks you. Finally, you will be able to use your PC and surf the web freely. In order to remove Sail Deals quickly, follow our instructions step by step. You can also scan your system with an antimalware scanner as well. Right-click on Sail Deals and click Uninstall. Select the program that you wish to remove and click Uninstall. Quick & tested solution for Sail Deals removal.